The Wall Map of Europe, painted by John Steuart Curry in 1928 is an impressive 16’ wide x 10’ tall mural, and the largest painting yet to be installed in the Beach Museum of Art galleries. The work, borrowed from the Burr Family Trust, required construction of a special “cradle” and use of a dedicated semi for its journey from Pennsylvania to the museum. 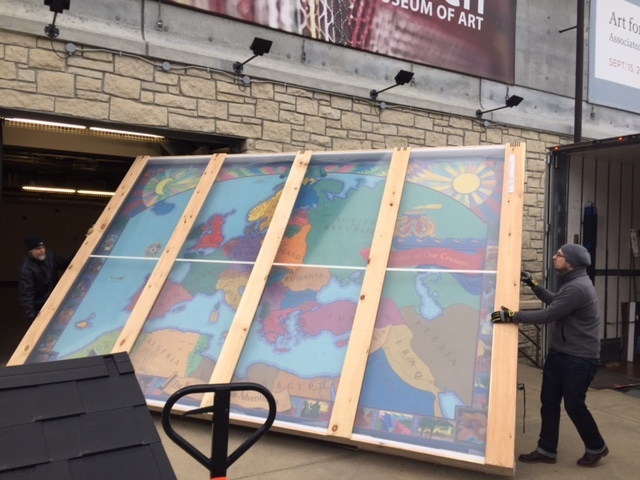 Once it arrived, moving the painting from the museum’s lower level loading dock up to the West Seaton Gallery proved to be a logistical enigma. The lower level halls feature various exposed mechanical and electrical systems that jut out from the ceiling, restricting the movement of tall objects through those spaces. Think of trying to fit a grand piano up the stairwell of a New York City walk-up apartment. Once we determined a way to move the Curry mural through these hallways to the freight elevator, a new problem emerged. We realized that the elevator was too shallow to fit the painting. 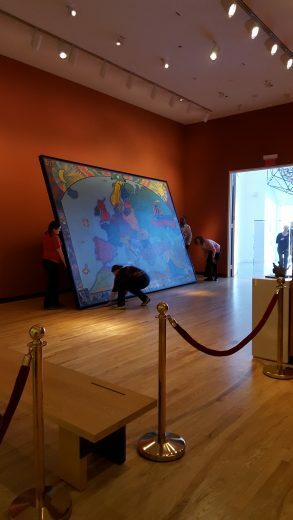 After several days of deliberation, museum staff concluded that there was no feasible way to move the painting safely into the second-floor galleries. Later that evening, at around 9:30 p.m., staff member Luke Dempsey, sent out an email saying something like, “WAIT, I THINK I HAVE AN IDEA!” After creating a 3D CAD model of the elevator, it was then determined by Lindsay Smith, Sarah Price, Theresa Ketterer, and Luke Dempsey that the elevator would accommodate the mural only if the interior safety gates could be raised by ThyssenKrupp elevator technicians. This solution provided the few inches needed to bring the mural to the upstairs galleries. Thanks to our very dedicated team, and careful planning with the technicians, it worked! 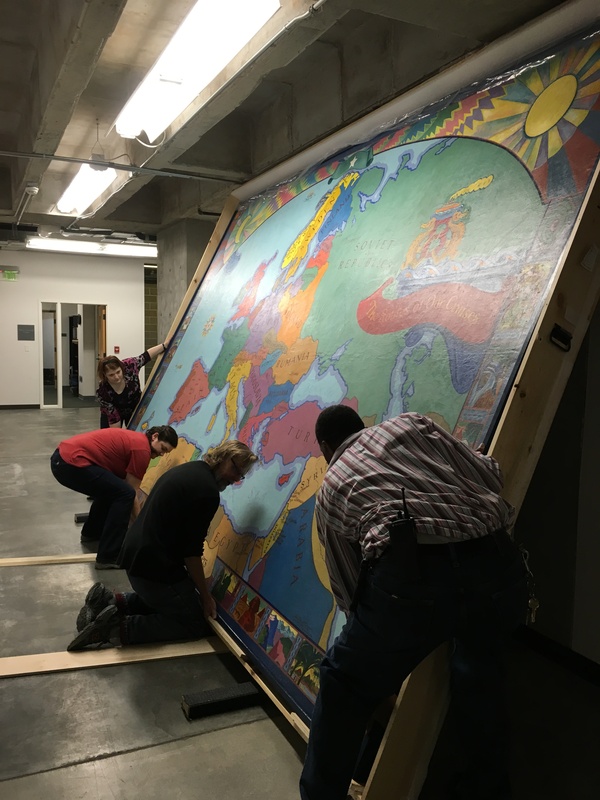 It took six trained staff and what seemed like a thirty-nine minute eternity, to move the massive mural approximately 400 feet. It now rests safely in West Seaton Gallery. We hope visitors enjoy this unusual artwork’s stay in the museum through fall 2017. Have you ever wondered how a title wall for an exhibition is installed? Watch this time lapse video to see how we installed the Dinner & a Mid-night Snack exhibition title wall. This video post was created by the Technology and Design Coordinator of the Marianna Kistler Beach Museum of Art, Luke Dempsey.